Despite having a hard enamel exterior, teeth are actually quite delicate. Many people experience a tooth ache at some point in their life. The cause of tooth pain can vary, but can be caused by infection, a tooth fracture, ill-fitting crown or filling, excessive tooth sensitivity, tooth decay, tooth grinding (bruxism) or abscess. Read on to find out more about the signs and symptoms and how to treat the pain. Most importantly, if you feel pain it is important to seek consult from a dentist as soon as possible and not delay on required treatment. Most causes of tooth pain will not resolve on its own, and foregoing treatment can cause a condition to worsen. There are several reasons that a tooth might hurt. General causes of toothache can be tooth decay or a cracked tooth, which can leave the tissues in and around the tooth and interior nerves exposed to irritation and infection, causing pain. Pulpitis is the inflammation of the tooth pulp, the interior part of the tooth that contains blood vessels, nerves and cells. When bacteria enter the pulp, the resulting infection can cause pain and even permanent damage to a tooth. An abscess is an infection around the root of the tooth; the pain may originate around the root of the tooth or base of the bone around the tooth, a condition called acute periradicular periodontitis. Ill-fitting or loose crowns or dental restorations can cause tooth pain or sensitivity. Other causes of pain in the teeth include bruxism (tooth grinding), angina (heart pain) and also a severe sinus infection. Pain after recent dental work like a root canal or tooth extraction is common; however extreme pain after a tooth extraction can be a sign that the blood clot at the site of extraction is prematurely dislodged, a condition called dry socket. A generally sore tooth can be a sign of a number of conditions. Soreness in a tooth can originate from within a cavity or cracked tooth, or indicate infection inside or around the tooth. Sensitivity to heat can be an indicator of a crack in the tooth or a leaking dental restoration like a crown or filling. Bacteria present inside the tooth produce gas as a byproduct. When the bacteria release gas inside the tooth, there is nowhere for the gas to escape and instead the pressure inside the tooth builds and applies to the nerve tissue within the tooth, causing pain. Sensitivity to cold, liquids or sweets is often a sign of exposed dentin, the secondary layer of the tooth which has an osmotic property that allows fluids to move in and out of the tooth. These liquids flow through the dentin and can irritate the nerves inside the pulp of the tooth. 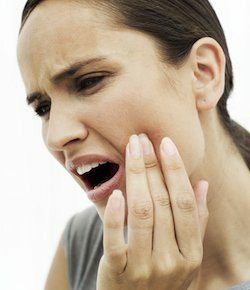 Throbbing pain is the result of increased blood flow to the tooth, which is what happens when a tooth becomes inflamed. All or multiple teeth hurting is called generalized tooth pain. One reason that all your teeth may hurt is due to chronic bruxism (tooth grinding). Gingival recession (receding gums) can cause pain by leaving multiple tooth roots exposed. Likewise, severe gingivitis and periodontitis can produce inflammation and causes pain. Moreover, excessive tooth decay or enamel erosion can cause pain. People with chronic acid reflux, eating disorders or the prolonged use of chemical bleaching products can all demineralize tooth enamel. Wisdom teeth pain is common in those with impacted wisdom teeth, teeth that have not erupted yet. Pain in erupted wisdom teeth could signal a cavity or infection in or around the tooth. It is important to address tooth pain with your dentist immediately. Your dentist will examine and x-ray the area to determine the cause of the pain. Do not attempt to treat a tooth ache at home without first consulting your dentist. Your dentist may recommend using over-the-counter pain relievers and topical analgesics that temporarily numb the area. Over-the-counter pain relievers such as ibuprophen can provide temporary relief from pain until your dental appointment, but do not apply aspirin or other pain relievers directly to the affected area as this can cause burning and further irritation. At-home temporary sealants for cracked and broken teeth, made for short-term relief, can help reduce the exposure of the interior portions of the tooth until you see a dentist. Be advised that at-home treatments are not made for long-term relief, and it is not advised to use these materials outside of their intended purpose and without first consulting a dentist. Moreover, it is not safe to use non-dental products to repair a tooth. Your dentist may decide to use a number of treatments to repair an infected tooth. Crowns are used to protect a tooth that is cracked or decayed from further damage. In the case of an abscess, a root canal may be prescribed to remove infected tissue and bacteria and reseal the tooth. You dentist may also prescribe antibiotics to treat an infection in the tooth or gums. Jefferson Dental offers same day emergency dental walk-in appointments six days a week. For more information about locations and hours of operations click here.